I was incredibly lucky to have seven Nathan Hale High School students shadow me for a project this past spring called Authors of Change. 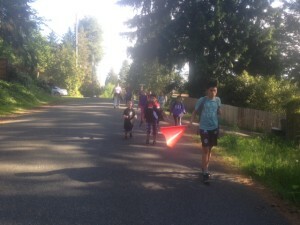 The Hale students joined Walking School Buses, greeted students on Two Feet Tuesdays, organized the Before School Walking Club at Olympic Hills, and ran Bike Rodeos at two neighborhood block parties. They even dressed up as Camina the Feet First Chicken! Their support allowed me to expand programming in ways that made the Walk to School campaign more inclusive and engaging for the elementary school students. A huge thank you to Elizabeth, Aleeah, Helen, Levi, Jesus, Abdullah, and Nischal! 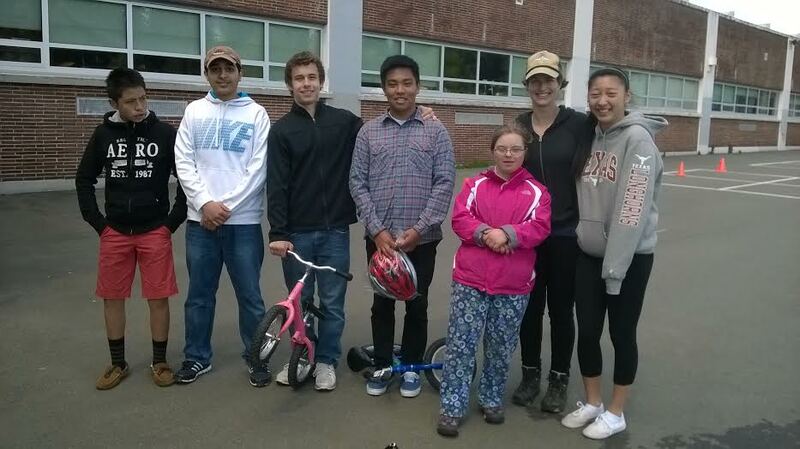 Read about the experience of volunteering with Feet First from the perspective of Nathan Hale High School students Elizabeth Han and Aleeah Hackett. Before we started this project, we had a day where about ten people from different organizations came to Hale to share what their organization was about and what we could do with them for our AOC project to get involved. Zoe Harris was there representing Feet First, and I was immediately interested. I have always loved interacting with young kids, so I knew that for my AOC I would want to do something relating to kids. 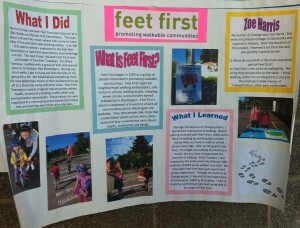 The first thing I did with Feet First was help out at a Bike Rodeo at Olympic Hills Elementary. I ran the first station where I explained to the kids the importance of looking both ways before entering a street. The kids seemed to really enjoy it and they kept coming back to go through the course again. It was awesome to see these young kids actually absorbing what I was telling them, and being eager to go out and do it again. The next part of my experience with Feet First was participating in Two Feet Tuesdays. 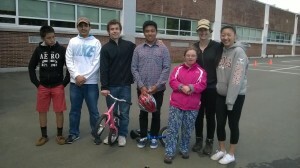 For three Tuesdays, I walked with a group of kids and several parents to Olympic Hills Elementary. During Two Feet Tuesdays, I got to just hang out with the kids in my group for a little bit. During our short walks, we talked about anything from the new Spiderman movie to their excitement to go off to a three day camp with their class. Two Feet Tuesdays is a great program that promotes safety, health, community-building, traffic relief, and environmentalism. These values are very important in a community, and it’s great that these kids are learning about them at young ages. My time with Feet First was such a great and unique experience. Through the Authors of Change project, I learned about the importance of community, walking, and safety. My name is Aleeah Hackett and I’m a sophomore at Seattle’s Nathan Hale High School. Our final project this year is called Authors of Change, or AOC, and it involves each student finding an organization that is making changes around the community. My first option for this project was Feet First, which seemed like the best choice because my mentor, Zoe Harris, was working with the same elementary school that I went too, Olympic Hills. really wanted to make changes around the community, especially in schools around Seattle. While working with Zoe, I was able to go to Olympic Hills and work with kids during Two Feet Tuesdays, which is when I was at the school and I helped her ask the kids if they walked to school. If they did, I gave them a punch on a punchcard. We tracked how many students walked in order to fill out a map of Washington for the school’s goal of walking across Washington… not literally! It was a way to encourage the students by having a collective goal. Through the AOC project I was trying to learn how this organization made a difference in our community and what we could do as individuals to contribute. During this project, I encouraged younger kids to be active and walk to school. We helped the school and had fun along the way! I’m very proud for being able to help Zoe and Feet First during this project.